Michael Knowles runs at the Leigh defence last Sunday. 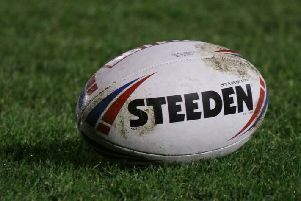 Dewsbury Rams coach Neil Kelly admitted that the predicament Leigh Centurions found themselves in last Sunday is an indictment of the current climate of rugby league at Championship level. Leigh arrived at Tetley’s Stadium with only 13 players and no substitutes for the final Championship Shield game of the season. The Rams produced a professional display to run out 52-6 winners and enure they gave Kelly a happy send off in his final game in charge. Speaking after Sunday’s victory, which was enough for Dewsbury to claim a fourth place finish in the Championship Shield table, Kelly said: “I think its an indictment of the whole game in general at the moment that great clubs like Leigh can turn up to a ground with only 13 players and Featherstone playing teams with 14 players. “Unfortunately I have been involved in games where you are playing against teams who don’t have a full compliment of players but it’s important that you still do what you need to to get the win. “If you start to treat them like they are a weakened side or an understrength side you can end up looking embarrassed. “It was important that we did the right things at the right end of the game to capitalise on the lack of numbers that they had. “We asked the players at half-time how do you want to win the game? “When we did complete and did defend, we forced the errors and we scored tries. “We recognised the percentage side of the game and thankfully we did the right thing. “The last 15 or 20 minutes were a bit scrappy but that was the way the nature of the game evolved. “It was the (first) 20 minutes, half an hour, before fatigue starts to play a part that I was most pleased with.